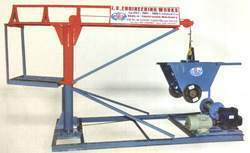 Leading Manufacturer of monkey hoist machine, monkey crane machine and electric hoist machine from Ghaziabad. 70 Meter (10mm) (Mahadev Co.
Pully with Bearing 3 Nos. Automatic stop, if any electric fault. Heavy duty gearbox Garari Gun Metal with oil bath. Pulley with Bearing 3 Nos.